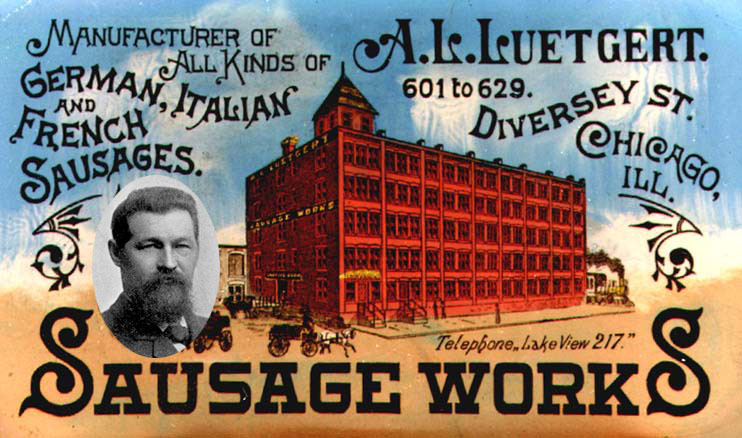 The Luetgert Sausage Factory Murder is a hard story to tell – any time the words “sausage” and “murder” are right in the title, the story is going to be anti-climactic if nobody gets eaten. And no one did get eaten here – Luetgert, from what the cops could piece together from witnesses, had killed Louisa, dragged the body in the basement, then mixed up a caustic, stinky red mixture in one of the cure vats. The janitor hired to stir it spoke little English, but eventually described the mixture as “schleimish,” and everyone knew just what he meant. The body was dissolved except for a few bone fragments. 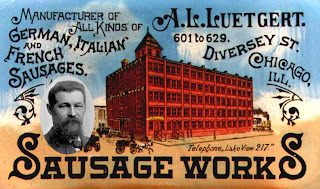 In a twist that we run into a lot, the sausage factory itself is often said to have burned down over a century ago; one book I read even has experts discussing where it wold have been, with one contending that part of the foundation was still visible only a couple of decades ago. In fact, the building is still standing. There was a fire, but it failed to destroy it. And ghost sightings have come in sporadically. Luetgert himself was apparently seeing ghosts there, because during the investigation he loudly accused the police of “hiring” ghosts to scare him. A neighbor and witness, Agatha Tosche, even had to swear in court that she’d never dressed up as Louisa’s ghost and walked the halls of the factory. Years later, a police officer patrolling the area said that he chased a ghost through the basement. This is the same officer who claimed to shoot at the Sambrero Man who appeared and disappeared in Lincoln Park. And, more recently, a family who lived there in the 1970s had stories about poltergeist activity in the basement. The building, of course, is condos now, located at 1735 W Diversey. The eastern portion is new; the the west side is the original factory. I haven’t heard many ghost stories from current residents. There are some other Luetgert ghost stories going around, mostly centering on bars at the old Flounders Bar on Webster and Clybourn. In some versions of the story, this location was actually the butcher shop where “Louisa Links” were sold, and where he killed many other family members, but these are WAY off (there’s one particular guide in town who seems to have a real flair for making up stories about Adolph Luetgert). Luetgert did have a tavern on that corner, but only until 1879 (the current building was built a few years later). There’s no evidence whatsoever that Luetgert killed his first wife or any children in that location (those who died clearly did of natural causes, according to records). He may, however, have killed an annoying customer / nearby loiterer by shoving chewing tobacco down his throat during his time there, though. The scenario the police imagined when they found the body was that Luetgert had warned him to quit spitting tobacco on his sidewalk, and when he didn’t, flew into a rage and rammed a wad of it down his throat, choking him to death. There was no proof of this, though (later stories that he split the guy’s throat in half are modern exaggerations). Luetgert was not a serial killer – just a Ron Swanson-esque brute with some SERIOUS anger management issues.